PSAs Folz at the China launch of the 206. Chinese exports to Europe may be a threat to European carmakers in the long term, Folz says. 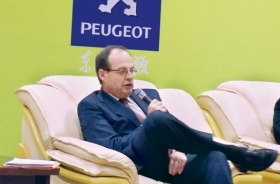 PSA/Peugeot-Citroen CEO Jean-Martin Folz is overseeing a return of the Peugeot brand to China, along with updating the Citroen brand there. He talked with Automotive News Europe China staff reporter Alysha Webb about the difficulties of the Chinese market, exporting parts, and PSAs outlook for 2006. How do you think the Chinese market is developing? One thing has changed a lot since the end of the 1990s. Then, the market was 1/3 taxis, 1/3 government fleets, 1/3 individuals. Now, it is 90 percent individuals. This is a massive change. For 80 percent of those individuals, this is the first car they buy. It is very, very difficult to do any marketing or to make any provisions about expectations. It is very difficult to get the trends. 3. The consistent growth. Such a growth rate, we have not seen anywhere. How often will you be in China this year? I came six times last year. At least that many this year. Are Chinese cars that are being exported to Europe a threat? They will be a threat someday, but when? I am not sure of the answer. Nearly all the cars in Europes market are produced in Europe. The growth company last year in Europe was Hyundai/Kia; today it is building plants in Europe. That proves that mass export of cars from one region to another has no valid business case. If Chinese cars ever start to take market share in Europe, those cars will be manufactured in Europe. What will your profit situation be this year? We had been making profits until 2004, which was a negative year. 2005 will be better. I will not say more. How are your operating margins? Are they recovering? We announced our final 2005 operating margins last week – 3.4 percent. The fourth quarter was much worse than we expected. We controlled inventory and de-creased production. I will comment on our margins for 2006 on February 9.